On the 31st anniversary of the EDSA uprising, it is time to admit the bitter truth that its failed promise has laid the fertile ground for the revival of authoritarianism and a revision of history. As working class millennials—community youth and young workers—we are witness, nay victims, to the disaster of three decades of EDSA democracy. Poverty, inequality and injustice have persisted and plagued our country since 1986. True these were a pestilence even during the Marcos dictatorship despite recent attempts to prettify the thingy called martial law. The infamous infrastructure projects of Marcos which keeps popping up on social media were no more than just opportunities to rob the people while pushing generations of Filipinos deep into debt. The plunder of the national treasury and the systematic human rights violations by the state still have no parallel during the post-EDSA regimes. Abuse of power is necessarily worse under a dictatorial regime which does not have to bother with the niceties of due process, civil liberties, press freedom or a political opposition. 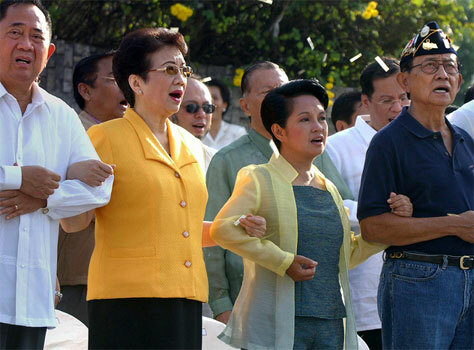 All those political—and social, we should not forget—contradictions during the 14 years of the Marcos dictatorship finally exploded in that historic event called the “people power uprising.” While the yearning for democracy was central to EDSA, the cause of social justice—the demand of workers for rights, of peasants for land, of students for reform, among others—was no less a key impetus. Yet under the leadership of the Dilawan, to be exact the elite faction opposed to the Marcos dictatorship, the democracy built after EDSA was only a caricature. The EDSA democracy is a skeleton without flesh. The formality is there but the substance is lacking. Elections are a farce. Instead of an exercise in democracy, it is a rigodon for dynasties and warlords. Regime after regime played deaf to the cry for social justice as globalization dictated by the IMF and WTO was embraced. Cheap labor was used as come on for foreign investors. Farmers buckled under the onslaught of cheap imports. Social services suffered as the national budget was decimated by debt outlays, a big part of which was to pay loans taken out by Marcos. With a bleak future in the country, millions of Filipinos migrated despite all the sacrifices and difficulties. To those living in the purgatory of the EDSA democracy, the hell of martial law is little comfort. No surprise then that purveyors of fake news, creative imagination and alternative facts are having a field day. EDSA’s epic fail created a vacuum that is being filled by an authoritarian throwback. Cory Aquino made agrarian reform a centerpiece program but almost three decades hence, Hacienda Luisita remains controversial and the most fertile lands in Negros and Mindanao are still in the hands of capitalist landlords and multinational companies. Since EDSA’s let-down is plain to see, memes of a Marcos golden age look like fact rather than fiction. Is a return to the past the answer to the misery of the present? We say no, as young Filipinos who wish the best for our country. Is it time to move on instead of celebrate EDSA as the Duterte administration say? We say no, for we believe the real alternative is to level up EDSA. People power is hollow without democratizing power. Only a decisive resolution to the demands of workers for decent jobs, of farmers to control of land, of the poor for social protection and of the people for national sovereignty will rid the country of the plaque of destitution and inequity. Empowering the people—providing economic security to the masses and also their participation in policy decisions—will pull the rug from underneath historical revisionists and wannabee dictators.